Most people don't use their boat all the time so purchasing a 1/4 share can make good sense. Affordable, luxury boating where all the expenses are divided equally between the owners. This is not a time share, you actually own the boat and a deed is drawn up between the owners. This has been going since the boat was new and you can be part of a very successful boat share. Take the boat anywhere you like, it's professionally detailed and maintained, just fill it up when you get back, it's that easy. 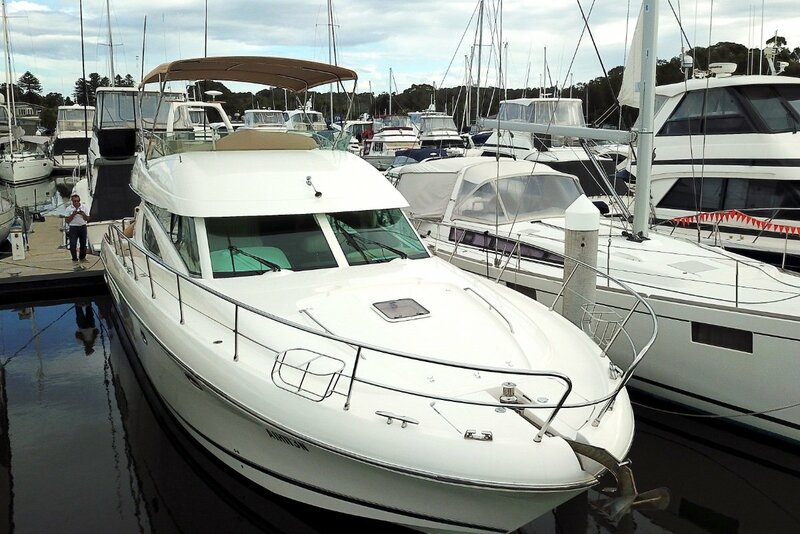 The boat is currently berthed at Marmong Point Marina, Lake Macquarie, great spot. Parking is a breeze with bow and stern thrusters & electronic throttle controls. If you have never driven a big boat, don't worry we will teach you and show you just how easy it really is. This is not just a boat, its a full luxury floating apartment with 11kva genset, 3 air conditioner zones and ice machine and even has an inflatable. The prestige is exactly that and has a lux feel about it. Wake up to the coffee machine making a fresh brew in air conditioned comfort (heating too) and you will wonder why didn't we do this sooner! It's a holiday that never ends and with Lake Macquarie, Hawksbury River, Port Stephens, Myall Lakes and Sydney Harbour on your doorstep it really isn't just a lifestyle for the privilege few. This is easier than you think! DCM Cummins with full NMEA and digital control, 490hp each that are so smooth and powerful that only 30% of the full engine power is required to plane this craft. They look like new. Electric stove, microwave/oven, coffee machine and the list goes on its a clever galley that steps down so can be used when under way for long trips. 3 separate zones, so pick a comfortable temp for you. Built in battery chargers and full electronic controlled automated systems. You don't need to really know anything because the boat does all the thinking for you and its as simple as turn one key and your away. Anchor winch, cushions for every area including bow, a rigid inflatable with 5hp Mercury motor, 2 x electric BBQ's and the list goes on.